Sometimes you just need some ice cream. For me, that is all the time. Really. Currently I am obsessed with this vanilla milkshake we serve at my workplace that has frozen pieces of chocolate chip cookie in it. Sounds amazing right? Well now you have the chance to taste it too. Obviously since the cookies are frozen, it takes some work to put this shake together. Have no fear, though. The payoff is worth it. 1. Place the cookies in a ziplock bag in your freezer for several hours or overnight. 2. Take the cookies out of the freezer and chop them into small pieces. 3. Pour into a large glass and top with whipped cream. 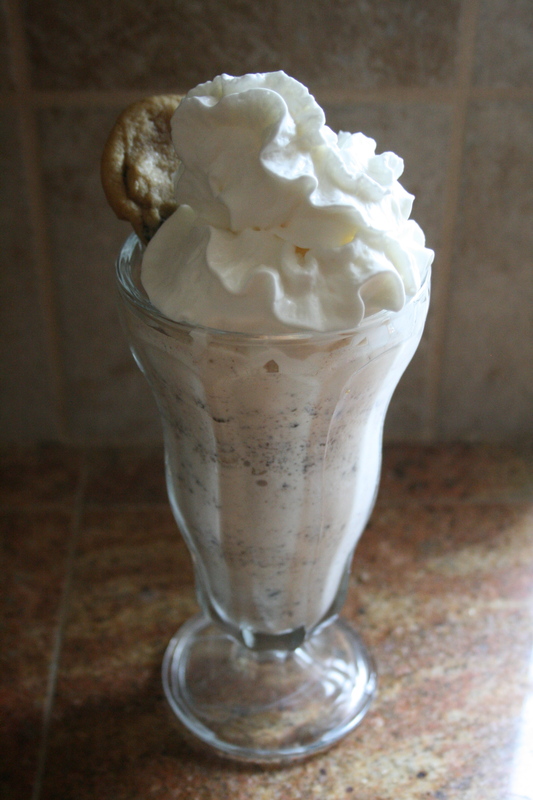 This entry was posted in Desserts and tagged chocolate, cookie, ice cream, milkshake. Bookmark the permalink. Uh! There is nothing better than a freshly baked chocolate chip cookie. Put it in a shake? Heaven.